1. Confidential investigative expenses are for the purchase of services and would include travel or transportation of an undercover officer or an informant. The lease of an apartment, business front, luxury type automobiles, a boat, aircraft or similar effects to establish the appearance of affluence, credibility and a general atmosphere conducive to the undercover role would also be in this category. Meals, beverages, entertainment and similar expenses for undercover purposes, within reasonable limits, would also be included. 2. Confidential funds for the purchase of evidence would include the purchase of evidence and/or contraband such as drugs, firearms, stolen property, etc., required to determine the existence of a crime or to establish the identity of a participant in a crime. 3. Confidential funds for the purchase of specific information from informants. 3.8.9.20 Confidential expenditures are subject to appropriation by the municipality’s governing body. The governing body must assure that the controls over disbursements are adequate to safeguard against misuse of such funds. When the funds are replenished, legislative approval should be based on a finding that the expenditures were necessary and reasonable for proper and efficient administration of the program under which they were used. 1. The supervisor of the unit to which the imprest fund is assigned must authorize all advances of moneys to agents or officers for the purchase of information. Such authorization must specify the information to be received, the amount of expenditures, and assumed name of informer. 2. The investigation unit must maintain confidential files of the true names, assumed names, and signature of all informers to whom payments have been made. To the extent practicable pictures and/or fingerprints of the informer payee should also be maintained. 3. The custodian should receive from the agency or officer authorized to make a confidential payment, a receipt for cash advanced to him/her for such purposes. 5. 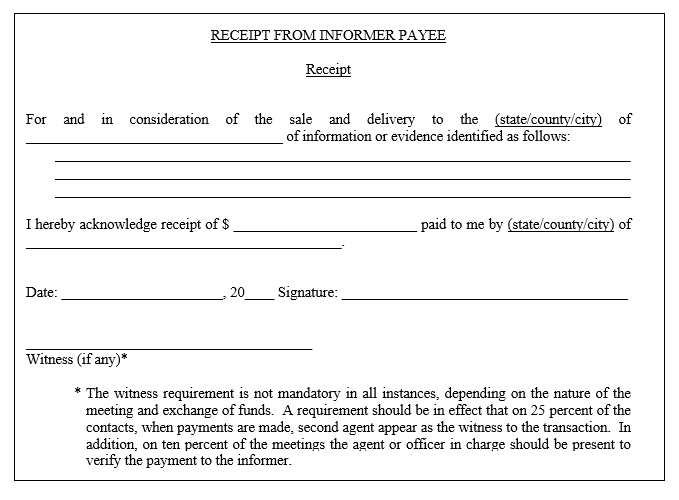 The signed receipt from the informer payee with a memorandum detailing the information received must be forwarded to the agent or officer in charge. The agency or officer in charge must compare the signature on the receipt with the confidential file of assumed name signatures. He/she must also evaluate the information received in relation to the expense incurred, and add his/her evaluation remarks to the report of the agent or officer who made the expenditure. A certification of payment to the custodian should serve as support for the expenditure from the imprest fund. The certification should be witnessed by the agent or officer in charge on the basis of the report and informer payee’s receipt. 6. Each agent or officer in charge must prepare a quarterly report showing status and reconciliation of the imprest fund and itemizing each payment, name used by informer payee, information received and use to which information was put. This report must be made part of the files and reviewed quarterly by the head of the municipality’s law enforcement agency.